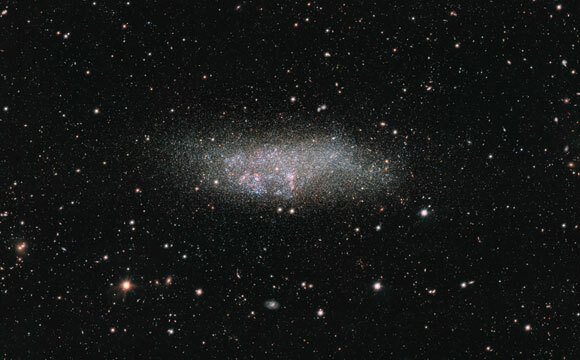 This newly released image shows the Wolf-Lundmark-Melotte galaxy. WLM is quite small and lacks structure, hence its classification as a dwarf irregular galaxy. WLM spans about 8,000 light-years at its greatest extent, a measurement that includes a halo of extremely old stars discovered in 1996. This detailed image was captured by the OmegaCAM wide-field imager, a huge camera mounted on ESO’s VLT Survey Telescope (VST) in Chile — a 2.6-metre telescope exclusively designed to survey the night sky in visible light. OmegaCAM’s 32 CCD detectors create 256-megapixel images, offering a very detailed wide-field view of the cosmos. 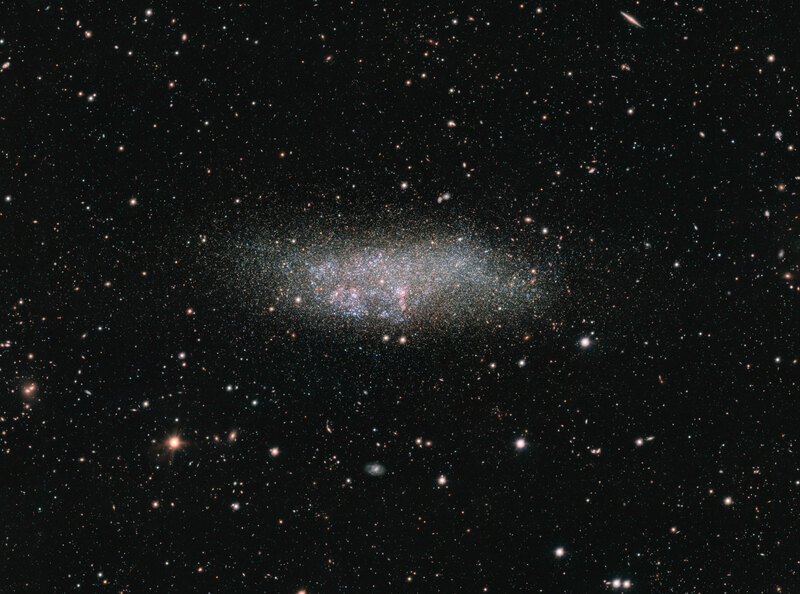 1 Comment on "VLT Survey Telescope Views Wolf-Lundmark-Melotte Galaxy"
“Astronomers think that comparatively small primeval galaxies gravitationally interacted with each other and in many cases merged, building up into larger composite galaxies. Over billions of years, this merging process assembled the large spiral and elliptical galaxies that now appear to be common in the modern Universe. Galaxies congregating in this manner is similar to the way in which human populations have shifted over thousands of years and intermixed into larger settlements, eventually giving rise to today’s megacities. These two paragraphs are a contradiction because the author again chose to entertain the notion of a hypothetical “merger” scenario. A fission event, like all the others that made object systems, is more likely and this article confirms that. Here is a link to understanding hypothesis and theory. We are collecting data about paired-object systems if anyone is interested in pursuing the science of galaxy formation.